Add value without adding cost. Small group communication skills are increasingly vital both in a wide variety of college classes and in the professional world where organizations hold meetings and create teams as part of day-to-day problem solving. 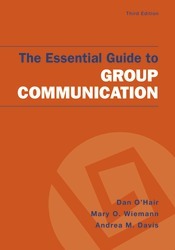 After a brief introduction to communication theory, this concise and insightful text explains the role of group communication within organizations and in other settings. It then moves on to explain the various roles in a group environment and useful guidelines for acting as an effective leader, avoiding groupthink, and achieving optimal results. With new content on communicating in organizations, leadership and decision making in groups, the latest in communication technology, and advice and tips for using mediated communication, the third edition of the Essential Guide to Group Communication provides valuable and current guidance to today’s students.